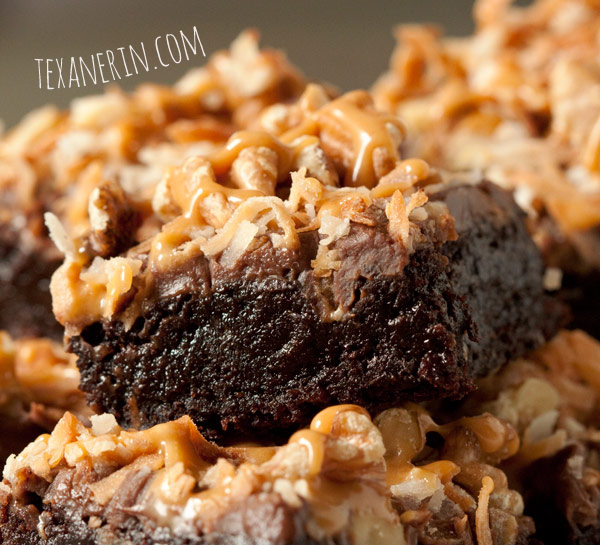 You’d never know that these super gooey German chocolate inspired brownies have been made healthier! These are hands down the best brownies I’ve ever made. Healthy or not. It could have something to do with the fact that I used way more sugar than usual but I’ll just try to ignore that. You can absolutely make these as plain brownies and they’re really amazing that way. And much quicker to make! But I wanted to make these brownies pretty. So I went to Facebook and asked you guys what to do with them and tried to combine as many suggestions as possible. That’s where the caramel + coconut + pecan / walnuts combination came from. I fully intended on making these as real German chocolate brownies and not just inspired but then I read what German chocolate filling is made of. It didn’t really appeal so much to me so I just made a simple chocolate ganache and spread this over the brownies. And then I added toasted coconut and pecans and drizzled on some caramel. If you do make these and you want to reduce the sugar, please note that they won’t be as gooey and they’ll be more cakey. These brownies really aren’t greasy, even if pictures kind of make them look that way. I kept my brownies refrigerated but they’re fine at room temperature as well. They just seem better cold! Preheat the oven to 350 degrees F. Place a sheet of parchment paper over an 8x8 inch pan and press it around the edges. This makes it easier to remove the brownies once baked. Or you can spray the pan with non-stick baking spray. In a large bowl with a wooden spoon, mix together the sugar and grapeseed oil. Let it sit for 5 minutes to help dissolve the sugar. Add in the eggs and vanilla, all at once, and stir until thoroughly combined. Add in the whole wheat flour, cocoa powder and salt all at once and stir *just* until combined. If you overstir, the texture might be affected. Bake for 17 minutes. If you stick a toothpick in the middle, it will come out wet and this is okay! They continue to cook after you remove them from the oven. Do not bake until the toothpick comes out clean! Let the brownies cool in the pan. Toast the coconut and pecans for 5 - 10 minutes at 350 degrees F or until they smell toasted. Check after 5 minutes to stir the coconut, if needed. Place chopped chocolate in a small mixing bowl and heat 1/4 cup heavy cream in a small pot over medium heat, just until it starts to simmer. Pour this over the chopped chocolate. Stir until smooth and set this aside. In the small pot you just used, over medium heat, add the caramel bits and another tablespoon of heavy cream. Stir together and continue stirring until combined. To assemble brownies: Spread on the chocolate layer. It will be very thin. Then add the toasted coconut and pecans and finally the caramel. You can either use a spoon to drizzle it over the brownies or pipe it. 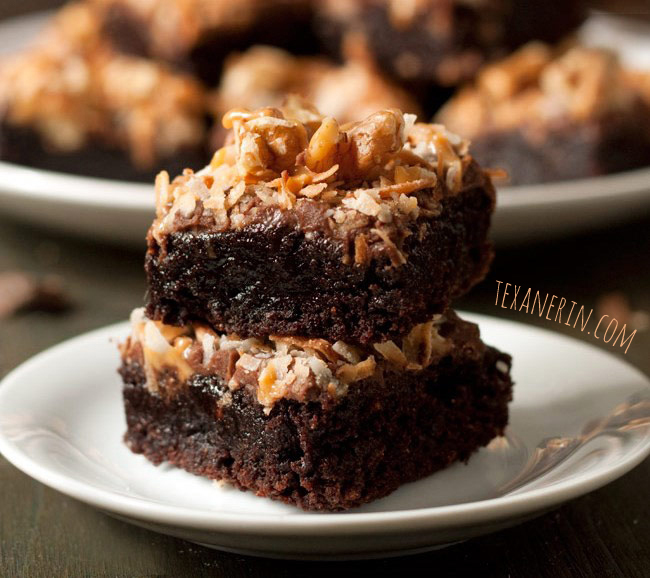 78 comments on “German Chocolate Inspired Brownies (100% whole grain, dairy-free)” — Add one! I would love to make these but want to raise the sugar question!! If I were to reduce the sugar, by how much would you suggest? I don’t really want them super gooey but not so it is cake. Oh wow! These look SO yummy! I love German Chocolate! Hi Erin, I just made these brownies today & they look SO YUMMY! I removed them w/ parchment paper from pan & the bottom still looks pretty undercooked. Is that how it is supposed to be? I have not cut or tried them yet. Figured they needed to cool completely. I notice in your pics they do appear really gooey. I just hope they are done! Took them out after 17 min like you said. Hope they are cooked!!!! I’m really excited to try this. Do you think that coconut sugar would work? Thank you very much for your insight. I grew up eating German chocolate brownies. I’ve always wondered why they were called “German” when they have coconut? Coconuts are the farthest from my mind when I hear “German” – hehe. Any chance you know the history of the name, LOL?!? Oh, yeah. I meant to talk about the origin of the name in my post but totally forgot. It’s not German at all, but Texan! I think the German refers to the chocolate? These look moist, chewy and delicious! Your cover photo makes me want to stick my hand into the computer screen and grab one of these right now. These so should have won! I love brownies, and these look so rich and fugdy! Hmm, I think so, too. ;) Thanks! I’m having trouble with WP’s comment system. Sorry I overlooked your comments! I hope you do try and enjoy these brownies. So fudgy… I wish I had some now! Omg they Look to die for. I am saying that after I had lunch and icecream. I would still try and eat my way through one piece of your brownies lol. I have been so swamped these past few weeks from studying and I’m just now getting around to reading all the blogs I follow! These brownies look amazing, and not greasy at all. They look really fudgy and delicious. Becca, you know how many months I’m behind with your blog? It’s a lot. So no worries there. ;) And it’s not just yours I’m behind with. But most. Holy moly, these sound incredible!! And the pictures, amazing! Totally need to make these soon. Pinned! Your brownies look SO good,, I love how fudgy they look! Love the idea of using grapeseed oil in them too. 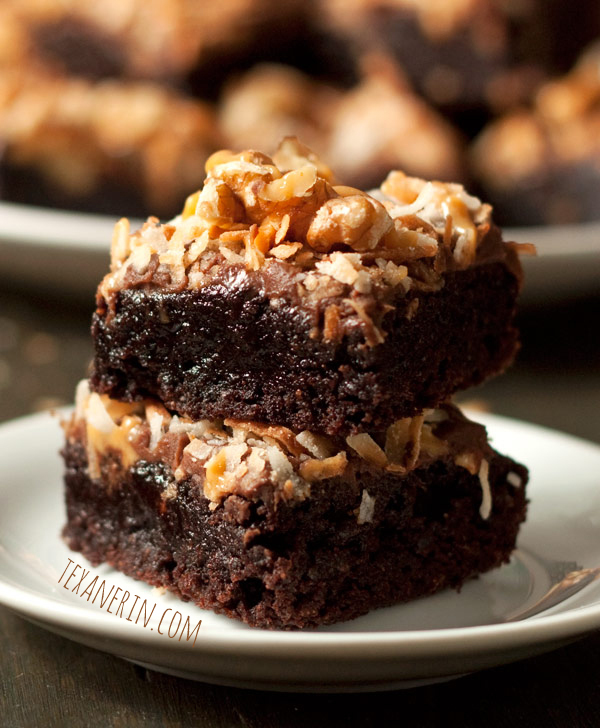 These brownies are mouthwatering! The new look is fabulous too! Nice job! Choc-o-licious!! Oh my, these look divine. I love grapeseed oil for stirfrys but have yet to use it in my baking. You have me inspired! It’s really great, Erin! Nice and mild. And I promise to get to your email soon. I think you can see what I’ve been up to lately. ;) Sorry about the delay! What brand of caramel bits did you use? All I can find are ones filled with nasty ingredients. Wow, these look unbelievable, I can't believe there's no butter ……… and whole grain? Very cool! Oh holy moly, these look SO divine. WANT WANT WANT NOOOOOOOW. Apologies for my demanding bossy comment, but I really want one! =) And yay for comments being back – I was so sad when I couldn't comment a few days ago! Oh wow, these look super rich and fudgy! Just the way I like them! Same here, Jessica! I just don’t get the concept of cakey brownies. Cakey brownies = a smaller version of cake. Right?! Thanks, Carla! I hope so, too. :D The prize is an all expenses paid trip to BlogHer. Isn’t that like the best prize ever?! Erin, these look amazing. So fudgy. So chocolately. So yummy! I also don’t use butter all that often. I’m definitely an oil or coconut oil type of gal. :) I stopped using butter in brownies a few years ago and seriously… I don’t miss it at all! I love brownies that use oil instead of butter and these look totally perfect, so wonderful and rich and gooey! These look amazing! I'm always trying half wheat flour half white flour but I've been too scared to "go all the way" :) You just proved me wrong! Pinned! These look so fudgy and decadent, my kind of chocolate heaven! Oooh these look so fudgy and delicious! Wow these look super good. Are these the ones you posted on FB not long ago and wanted to make them more fancy? because they sure look fancy to me. That coconut, walnut, caramel topping looks sinful :-) I have never used grapeseed oil before. I really like the look of these brownies and I am sure they are also super moist for the looks of it! Oh my word, Erin, these are dangerously tempting me right now!!! I need them…! I love your recipes! Do you think butter-flavor grapeseed oil would taste okay? Thanks, Patricia! I imagine it would be but I’ve never tried it. I was lucky to even get my hands on plain grapeseed oil. :) But as long as it’s not ridiculously artifically flavored… I don’t see how it would turn out badly! Awesome! I am going to try these. Wow…these sound amazing! I love the idea of using whole wheat flour! Awesome recipe!